Adoption Profile - Adoption Story - Hopeful adoptive parents, Larry and Nicole, wish to adopt a baby. We were set up on a blind date in 2012, by Nicole’s sister Lisa. Larry worked with Lisa at a New York City hospital for a few years. Lisa decided to set up Nicole and Larry on a blind date in New York City because she thought they would be a great match. She was right! That one blind date would change both our lives. 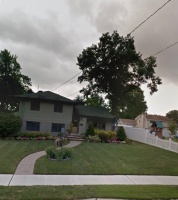 In January 2014, Nicole relocated from New Jersey to Long Island to be closer to Larry. 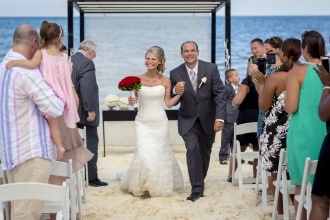 The following year, we had a destination wedding in Cancun, Mexico surrounded by close family and friends. Our family which we hope will grow, includes Lucas and Duncan. Lucas, Larry’s son and Nicole’s stepson, is a bright 11 year old boy who loves playing soccer, basketball and video games. He also enjoys having sleepovers with his friends. Duncan is our dog, a Goldendoodle, who loves children and playing fetch with anything that you can throw. The activities we enjoy together as a family include any exercise: running, hiking, volleyball. We participate in yearly 5K events for charity and for fun. We play in a volleyball league at night on the beach in the summer, and Lucas loves to come and practice and listen to the music playing during the games. Lucas will frequently challenge us to soccer games or relay races in our backyard. During the fall and summer we go to the park and play tennis, and Lucas never let's us leave without a game of tag on the playground. We love traveling and taking family vacations. It doesn’t matter if it is Europe or camping just an hour from home, good time spent with our family is what is most important to us. Safe, kid friendly neighborhood, close to beautiful parks and beaches. Larry, a Physician Assistant working in Long Island has been in the medical field for over 16 years. Nicole describes him as: reliable, intelligent, and fun loving. He is the man with the smile and comforting warm hug that makes all days seem better. Larry is one of the most selfless, kindest, and sweetest men I have ever known. He will do anything for anyone. Nicole is a Nurse Practitioner who currently works in Long Island, NY and has been in the medical field for over 10 years. Larry describes her as smart, outgoing, and energetic. He loves that she is very friendly and engaging, and has a special quality to get people to open up to her. She is a caring person who is truly interested in trying to make people’s lives better, both at her work, and among her friends and family. Larry says she “brings the sunshine” wherever she goes!